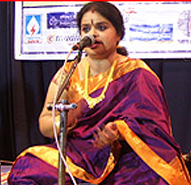 Chandrika Srinivas is a talented artiste, proficient in both music and dance. She hails from Bangalore and from last one decade is running a school called 'Nada nritya -school of performing arts' at Perth, Australia. On the auspicious day of Vijayadashami, she gave a dance recital, at the Seva sadana hall.No doubt, the keerthane "Bhavayami Raghuramam" is a popular composition in the music field. We can even say, it is a favourite krithi of both musicians and connoisseurs. But here Chandrika had made an intelligent adoption of Swathithirunal's composition 'Bhavayami' in dance, vouched for her choreographic skill.